For the 16 Days of Activism Against Gender Violence, Lisa Durnian examines patricide prosecutions where children killed their mothers’ abusers, demonstrating how it is not just the immediate victims of violence who suffer in abusive households. Domestic murders are perhaps the most distressing type of homicide, particularly when parents kill their children. But children also kill parents. In Australia about thirteen homicides annually involve children committing parricide, and the majority of victims are fathers. Most offenders are adult children of victims, but around 11 per cent of parricides are committed by children aged ten to seventeen. Illustration of temperance tract “Sunlight and shadow”, 1880, John Bartholomew Gough. Image via Wikimedia Commons. Children usually commit domestic homicide because they are either severely mentally ill (showing signs of psychological deterioration before the event); ‘dangerously anti-social’ (with sociopathic tendencies); or victims of severe abuse. We know that children raised in violent homes are often victims of the same violence experienced by their mothers. But decades of research shows that children who witness ongoing family violence are often as psychologically and emotionally traumatised as physically abused children. It is unsurprising then that some children who witness intrafamilial abuse will also commit patricide. 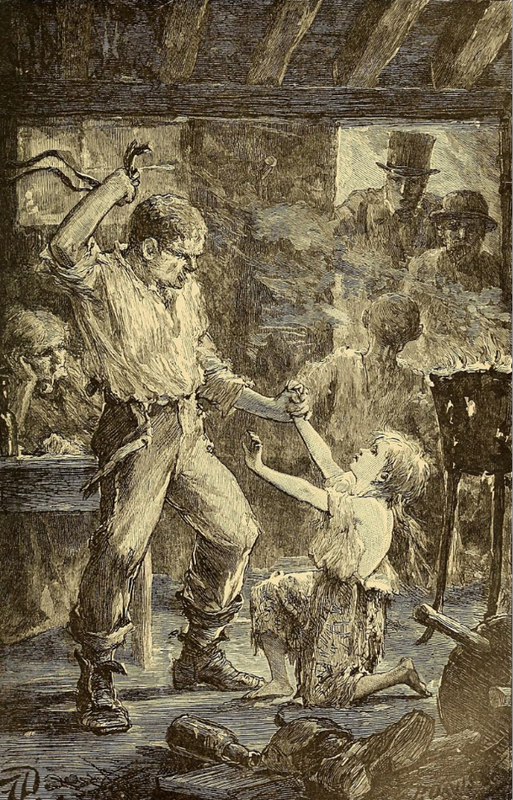 This blog draws on historical criminal cases involving adolescents and young adults responsible for the deaths of their fathers, stepfathers or mother’s boyfriends. It explores how all-male juries and courts historically responded to patricide in family environments characterised by domestic violence. Australian historical research on homicide indicates a level of sympathetic understanding of the dynamics of family violence. Colonial women standing trial for murdering their husbands were more likely to be acquitted of homicide or attempted homicide when juries were told of their experiences of family violence at the hands of the deceased. Ironically, today such acquittals are rare, despite recognition of conditions such as battered woman syndrome. The historical justice system was not so much pro-woman in these matters as they were reluctant to penalise violent actions that occurred in the familial realm in general. Violent men who killed their partners were also treated with leniency, often receiving a ‘domestic discount’ in their sentences. Men who killed their intimate female partners were more likely to see their death sentences commuted to life imprisonment than men sentenced for the murders of women who were strangers or acquaintances. This discount also extended to men who killed their children. Fathers were far more likely to avoid an eventual execution than other men who killed children. This raises interesting questions about how the court system historically responded to children who were charged with the deaths of their fathers, and whether there was any form of discount extended to them. A Trove search of the terms ‘defended mother/patricide/killed father’ reveals a surprising amount of newspaper reporting on children accused of killing their mother’s partners or ex-partners throughout the twentieth century. For the analysis presented here, I selected thirteen cases based on reports of children killing men in defence of mothers or where there was a history of domestic violence. The children included nine sons and four daughters aged fifteen to twenty-one. The offences occurred between 1909 and 1954. Most of the victims were fathers (ten cases), alongside two boyfriends and one step-father. I use the word ‘victim’ loosely. It is distressing to read the degree of violence perpetrated by these men against the women and their children. Most of the children had experienced family violence throughout their lives. Defendants, mothers, brothers, and sisters testified to violence consisting of frequent verbal abuse, beatings, and numerous attacks with weapons. In many cases defendants and their siblings told the court about their own physical and emotional victimisation. As one defendant stated, ‘Our life has been hell for a long time but it will be better now’. Mothers commonly testified to the men’s threats to kill them. Alarmingly, many of these threats were directed at the children. 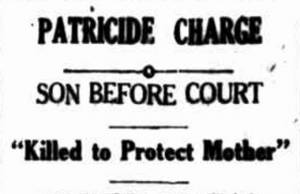 In 1931, a mother told the court that her husband had previously threatened to kill her, in front of the girls, then kill himself and leave the girls in State care. Her 16-year-old daughter was charged with manslaughter for shooting her father when he assaulted her and threatened to ‘do them all in’. There appears to have been little formal intervention prior to these homicides. Only two of the men were held accountable for their violent behaviour by the state. One of the fathers was on a six-month probation bond when his daughter shot him while he was choking her mother. His probation related to a previous attempt on the woman’s life. One mother’s boyfriend served two months imprisonment for assaulting her, and was only recently released in 1920 when her fifteen-year-old son killed him with a service revolver. The primary cause of death in most cases (eleven of thirteen) was due to gunshot wounds. Many of these guns were ex-service weapons. A nineteen-year-old married daughter told a 1946 court that she shot her father with a pistol given her by an American whilst she was in Brisbane. Guns were used in all the killings committed by girls. Sometimes children used whatever was close to hand. One sixteen-year-old boy threw a large stone at his mother’s boyfriend when she was attacked in the front yard. The man fell, and the head injury subsequently killed him. Ironically, many of the sons used weapons that the father or step-father had earlier threatened to use against their mothers. Almost all the children were charged with murder. Only one girl was charged with manslaughter. However, in two cases charges were dropped following the coroner’s inquiry. For example, in 1931, a sixteen-year-old boy killed his mother’s boyfriend when he attacked her in their front yard in front of onlookers. Sydney coroner, Mr May, ruled that the death was justifiable, noting that case law stipulated that ‘a child may defend its parent even to the point of taking the life of another, if there is good reason to believe the parent is in danger from this other’. Earlier in 1920, Melbourne deputy-coroner Mr Phillips ruled the death of a father as ‘misadventure’. He laid the responsibility for the death at the feet of the deceased who ‘was not worthy to bear the name of father, husband or man’. Typically though coroners ruled that defendants were answerable for the killings and committed them to stand trial. In 1949, a coroner said he did not believe the son’s story that the gun had discharged accidentally, shooting the father in the back of the head. This was after hearing evidence that on the day of his death, the father had chased the mother with an axe, and later assaulted her physically including choking her. In a 1948 case, the nineteen-year-old killed his stepfather with a German army rifle after being knocked unconscious by the man when he attempted to save his mother. The Coroner, although acknowledging that the son’s actions were ‘laudable’, committed him for trial because he questioned ‘whether he was justified in taking the final step’. In both cases, however, the juries decided that the killings were indeed justified, and acquitted both defendants. In fact, all-male juries acquitted all the defendants who stood trial, even though an indictment for murder meant a jury could also deliver an alternative verdict of manslaughter. In one summing-up, Justice Macfarlan reminded the jury that ‘a judge might think she deserves no punishment at all but she might still be guilty of manslaughter’. Yet none of the juries in these cases took that action. In the case of the married woman who shot her father, the jury was reported to have acquitted her of both murder and manslaughter. Acquittals were sometimes quick; five minutes in one case, ten minutes in another. Newspapers referred to these acquittals as ‘sympathetic’ verdicts. This raises questions about the two cases where children pleaded guilty because a guilty plea effectively deprived them of a possible acquittal. One boy pleaded guilty to the lesser offence of manslaughter, and was subsequently released on a three-year bond. This was, the judge admitted, an exceptional outcome in an offence involving a firearm, yet he was clearly swayed by the sentencing reports, including the investigating police detective’s claim that it was the father’s ongoing violence towards the mother and children that triggered the shooting. But there is nothing in this case which qualifies it from those where juries acquitted the defendant. It is unclear why the boy did not avail himself of the jury’s probable sympathy. The other guilty plea case is more complex. In 1953, a fifteen-year-old boy pleaded outright to murder after he attacked his father with an axe as he slept. At the time, father and son were sharing a bed in the boy’s married sister’s home. What differentiates this case from the other incidents is that the boy’s actions were not in response to an actual attack occurring at the time of the offence: the boy’s mother was living elsewhere and the father had not committed violence against her on the day or days preceding his death. Officials would naturally assume that she was therefore in no direct danger of being killed. And while the case law supported children legitimately killing another person to defend a parent when their life was in danger, this danger appears to have been understood as danger in the immediate present. However, the mother had instigated proceedings seeking maintenance support from her ex-husband. The boy stated that on the day of the killing, his father told him that if she succeeded then he would ‘do her in’, and the boy believed he would. The sister testified about the ongoing domestic violence she witnessed growing up, including an incident when her father shot her mother, and the defendant told of his father’s constant threats to cut his mother’s throat. During the sentence hearing, a psychologist reported that during a prison interview the boy said that ‘at least my mother will be safe now’. Tragically, the boy was probably right. Contemporary Australian statistics suggest women are at greatest risk of domestic homicide during or just after separation. The circumstances in this last case though were such that a jury, no matter how sympathetic, might struggle to acquit the defendant or even return an alternative manslaughter verdict. The boy made a full confession to police that he had intended to kill his father. The father was completely defenceless; he had not attacked the mother; and he had not been physically violent to his son prior to the killing. Perhaps the boy pleaded guilty in a plea bargain for a reduced sentence, in this case, indefinite detention at Her Majesty’s Pleasure. This was arguably more lenient than a death sentence (which in effect would have amounted to life imprisonment because government policy in Tasmania directed the commuting of death sentences from 1933 onwards). Although he and his family would not have had a date for his release, it did allow authorities to end his detention much earlier. These are only a handful of patricide cases but they raise interesting questions about the prosecution of children who kill in response to domestic violence. Were juries always so understanding of parricides motivated by abuse in the home? Did conviction rates change over time, particularly as the criminal prosecution process became increasingly dominated by guilty pleas? I can only think that if this was the case, then children from violent homes who killed violent men were deprived of any real justice. Moreover, apart from what has changed, it is apparent that too much remains the same. As in historic cases, contemporary parricide events usually involve those who have been failed by the authorities, and thus by society as a whole. 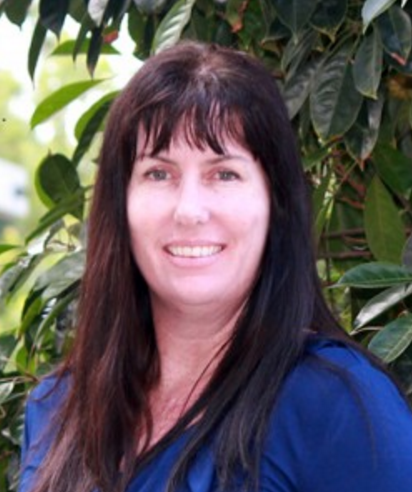 Lisa and her three sons are survivors of family violence. She asks readers to consider a donation to Brisbane feminist collective, Women’s House Shelta. Women’s House provides emergency accommodation and a variety of support services, including court support, to women and their children. They are truly amazing women. 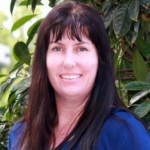 Lisa Durnian is a Griffith University Ph.D. candidate with the ARC-funded Prosecution Project. Her research investigates the historical development of the guilty plea in Australian criminal prosecutions, with a focus on the Queensland and Victorian Supreme Courts. Follow Lisa on Twitter @LisaDurnian.